Four-year-old Gia Tramontana enters kindergarten in 2019. She’s already getting prepared ‒ she can count to 30, and has a purple backpack adorned with a unicorn. She’ll walk into an elementary school in DeWitt the same year a new governor enters the governor’s office a few miles south in Lansing. Gia’s success in school, and the success of either Gretchen Whitmer or Bill Schuette in office, are inexorably linked. Michigan’s schools are flailing. Student scores are in the bottom third of states by most measures, and the bottom half in all. The percentage of Michigan adults with college degrees is below the national average. Whitmer, the Democratic candidate for governor, and Schuette, running on the Republican ticket, have made improving Michigan schools a major focus of their campaigns. And both have ambitious education policy recommendations that could lead to notable changes in the state’s public school system. Promises made from debate stages and policy papers on campaign websites don’t always translate into laws. Many reforms recommended by the two major-party candidates would require legislative approval, new funding or both. A Michigan school devoted to innovation. Here’s why others won’t follow. He loved teaching math in Michigan. Then he quit to manage a Chick-fil-A. Low-income Grand Rapids preschoolers are catching up. Will Lansing notice? But those proposed policies are the best clue voters have to compare the academic futures their sons and daughters might have under the divergent plans of the gubernatorial candidates. How Michigan schools fare under those plans, assuming they are implemented, will have a substantial bearing on the success of Michigan going forward. More personally, those policies also will leave an indelible mark on the school years of Gia and the about 100,000 other Michigan children who will enter kindergarten as the first generation of students shaped by Gov. Schuette, or Gov. Whitmer. Bridge spoke with nine Michigan education policy experts not affiliated with either campaign to get their predictions about what schools would look like under the two candidates. Some of the candidates’ policy proposals match recommendations of the dozen education reports issued in Michigan in recent years, while others have a partisan bent. None are likely to show results, positive or not, until, at the earliest, the end of the first four-year term of the winner. What follows are predictions of what Michigan schools would look like under a Schuette and Whitmer administration, based on their policy proposals and their likely ramifications. Under Gov. Schuette, Gia will walk into an elementary school in the fall of next year that is already different from what students experienced the year before. Schuette proposes a massive effort to improve early literacy, which includes placing a specialized reading coach in every elementary to train and support classroom teachers to more effectively teach reading. Early literacy is viewed as a predictor of later academic success, and the majority of Michigan’s third-graders are not reading at grade level. First-graders will get library cards. If Gia’s school under-performs in reading tests, the school may get a “dedicated reading instruction center,” though education experts who spoke to Bridge were uncertain if that meant a library. There could be more books on shelves in early elementary classrooms, particularly in schools that no longer have a staffed school library, as a means to encourage reading skills. Those in-classroom bookshelves will likely vary among schools, districts and counties under Schuette’s proposed public-private partnership plan, which seeks to entice business and philanthropic groups to pony up for school literacy services. Such a system helps keep a check on taxpayer money going to new school services. But it also means schools in communities that are home to thriving businesses and charitable organizations (Grand Rapids and Kalamazoo, for example) are likely to get more resources than schools in rural Michigan. When the school year ends, lower-income classmates at Gia’s school may get financial assistance to attend summer reading camps. All these literacy efforts build toward third grade, where, beginning in 2020, third-grade students will face a high-stakes test: show that they can read at a second-grade level or higher, or face the real possibility of being retained in grade. That “read or flunk” law is now on the books, and Schuette wants to keep it. So more kids will be held back, meaning thousands will be in school for an extra year. Parents at Gia’s school will also pay more attention to how the school is performing in every grade. If Schuette has his way, schools will be graded on an A-to-F rating system. If Gia’s school earns an A, it may get rewarded with extra money; if it earns an F, it eventually may be shut down and Gia’s parents will need to look for another school. Her family might get financial aid for transportation costs to that new school, which may have bear little resemblance to her old school, because Schuette would give greater priority to local control over state control. 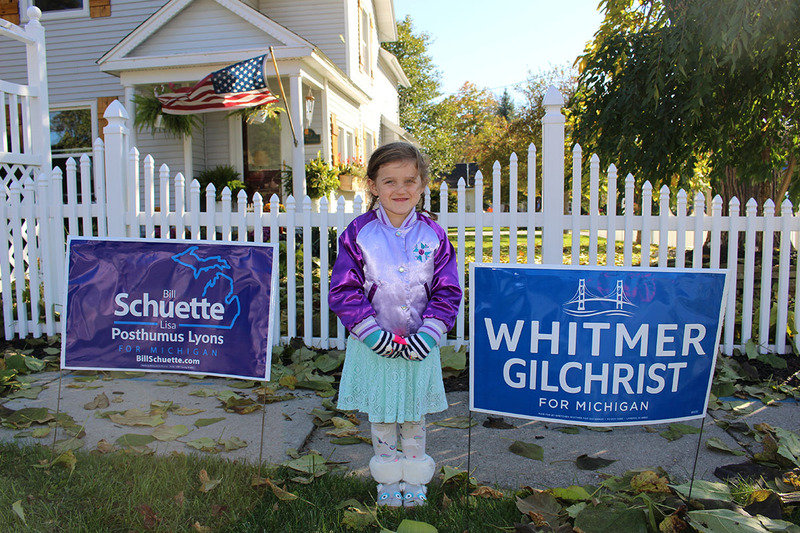 Because of term limits, Schuette would leave office when Gia and her classmates are in seventh grade. But if his policy positions continue through her senior year of high school, she’d have more opportunities for career tech classes and apprenticeships than are now available. Schuette’s plan calls for “restor(ing) a healthy balance between career and college preparation in our schools.” That likely means less time in high school classrooms for some students, and no increased emphasis on college prep or student financial aid. It could also mean more non-college-going students coming out of high school with skills and certifications to make a middle-class living, and more college-going students working full-time jobs while attending college part-time. You can read Schuette’s education plan here. If Whitmer’s policy proposals were already in place, Gia would be in taxpayer-funded, full-day preschool this year. Whitmer proposes universal pre-K for Michigan 4-year-olds, phasing in the expansion over her four-year term as governor by gradually expanding the state’s Great Start Readiness Program, which now offers full-day pre-K only to children from low- and moderate-income homes. The Democratic candidate’s education plan expands services for even the youngest of children, from in-home nurse visits for infants to increased state subsidies and eligibility levels for high-quality child care. She marks the “first 1000 days of a child’s life,” long before they enter kindergarten, as vital to improving Michigan’s school performance. Those types of early services would cost money – at least $100 million for GSRP expansion alone – but would likely result in fewer students starting kindergarten behind more affluent classmates and fewer placed in special education, because of the positive impact of catching problems early. Once in elementary school, Gia and her classmates would be exposed to more support staff than currently exist in most schools – more literacy coaches, counselors and nurses. One thing Gia likely wouldn’t see in school is a gun. Whitmer would ban guns in schools for everyone other than trained, licensed law-enforcement officers. Which Michigan 3rd-graders will flunk reading? The state has no idea. In a Whitmer public school system, Michigan’s third grade “read or flunk” policy would be revoked. Whitmer says students shouldn’t be penalized because adults haven’t figure out how to help them read. There would be fewer standardized tests and more reliance instead on school work done over the course of the year. All high schoolers would have access to two years of debt-free college or post-secondary training if they have good high school grades and attendance and are involved in community service. Perhaps the biggest change in schools would be something students might not notice. Whitmer would change Michigan’s school funding formula to provide more per-pupil funding for students who are more expensive to teach – English language learners, special education students and children from low-income households, for example. The effect: Schools in urban and rural areas would likely get more money per pupil from the state than affluent suburban districts, with the hope of increasing academic performance in communities where it is lagging now. Changing the funding model, universal pre-K, additional counselors and reading specialists and a big increase in scholarships for post-secondary education all costs money. Likely, taxpayers such as Gia’s parents, or the companies where Gia’s parents work, will pay more taxes for those school improvements. You can read Whitmer’s education plan here. No matter who wins Nov. 6, Gia’s school can expect to see more adults than before the election. Both candidates say they want to add early literacy coaches. Schuette wants more community members in schools to help with reading. Whitmer would add more counselors at all levels of school. Both candidates expect to use school buildings beyond the normal school day, with Whitmer proposing offering nutrition, dental and medical services for families, and Schutte suggesting adult education. Both want to rebuild career tech programs in high schools, with Schuette proposing a digital hub for student internships and apprenticeships, and Whitmer requiring seniors to complete a post-graduation career plan before graduation. The candidates agree college education departments can do a better job preparing new teachers for Michigan classrooms. Schuette wants more emphasis on literacy training; Whitmer encourages more evidence-based classroom strategies. Both agree on one more thing: Michigan’s schools aren’t doing enough to prepare kids like Gia for the future. Gia can’t wait to grow up. She boasts that she’s four and a half, not four, even though her birthday was just two months ago. Next year will bring a lot of changes for her, the 1.5 million students in Michigan schools, and whichever politician enters the governor’s office in January. Final pitch: Bill Gelineau: Michigan has a choice. Why not a Libertarian? Gretchen Whitmer says she accomplished more than her record shows. Did she? Bill Schuette wants to fix roads while cutting taxes. Good luck with that. Come on, Ron! It's DeWitt, not Dewitt. Fixed! Thanks for having our back. Does anyone ask those educating the students what they would like to see happen, because it seems like most of the "laws, policies, and rules" that go along with what's "taught and tested" is made-up by politicians! If you are told to teach for passing "the test", than that's all the students will ever learn in school! Ask, and include the educators in the education policy decisions! Does anyone, including teachers, ever ask the students [individually] why they learn and succeed academically, even ask them what are the barriers to learning and how and why they overcome those barriers or why they fail to overcome them? Who does learning, who do you want to learn, how does a student learn? Have you asked yourself those questions, because it sure doesn't seem any of the adults have asked those questions, including the politicians. Seriously, does any responsible adult believe their kid's future well being and success in school and otherwise depends on what governor sits in Lansing? If you do, you should probably stick with a dog. Schuette's failing schools plan is a dog whistle for expanding for profit charters at taxpayer expense. These schools are not accountable to the the taxpayer whose money they use. Remember the DeVos family has an oversized influence over the Republicans and education policies. Some might say they own the MI GOP. I don't like the idea of an A-F grading system for schools, I think it is going to stigmatize the schools getting a low grade and foster a self defeating "get me out of here" attitude among the students, parents and teachers so that nobody wants to really work to improve things and instead try to get into a higher rated school. It won't matter. Whatever is done will eventually be for naught. Gia and anybody coming in after her will have to deal with dying crops, less food, extreme temperatures etc etc. Nobody, not a single person concentrated on what really mattered. Whether it's man made or not it doesn't matter, the effects of climate change will be felt and it won't be good. So what we spend on schools, don't spend on schools won't matter. We all deserve this, it's what we get. When you say that students won't notice if the funding formula is changed to a more equitable amount based on student's needs, you are missing the point. The funding would allow schools to provide more services to students with disabilities or who are economically disadvantaged or are ESL learners. Why is Mr. French so sure it is the Michigan schools that are failing? Aren’t there high school graduates entering and earning degrees at Michigan Universities and prestigious universities around the country? Don’t such graduates number in the thousands each year? If this is so, how can Mr. French be so confident that it is Michigan schools that are failing? What if Mr. French is wrong and it is the student who determines whether they learn or not? What if it is the student who determines whether they study or not? Why don’t we consider the student, their role/responsibilities in their learning? I wonder if Mr. French has noticed that in each classroom [where everything is equally available] that there is a distribution of academic success? I wonder if he has considered the key variable is the student. I wonder if Mr. French considered himself the exception or the ‘rule’ in school. I was the ‘rule’; learning was in direct relation to the effort I spent on studying. I wonder if rather than saying how bad our schools are we focused on how to help the student want to learn, help them overcome the barriers to their studying, and taught how to learn. The new reality is that once out of school and in a career they will have to continue learning on their own, if they haven’t learned how to learn and created the habit of learning they will soon be left behind in jobs that payless because there is less for the worker to do to add value. After all this time of blaming the schools with continued disappointing results, it is time to move the focus from the adults to the students [who actually do the learning] finding how and why they succeed or fail. Did any of the candidates consider going back to providing a basic education as outlined in the state constitution in the AM and offering everything else (music, art, CTE, programming, auto body , culinary and CAD/CAM) in the afternoon and only after basic skills have been mastered? Local school boards currently control budgets that are comprised of state funding in 60-80% range with minimal state oversight and those funds are being misappropriated when they are being used for things other than meeting their districts basic education requirements. Do not misinterpret what I am saying, I support music, art, athletics and CTE but only after the basic education requirements for all students have been met. To right the ship a large percentage of the SAF should be dedicated to basic education with the balance spread out to fund ancillary grant programs. The local community should then vote on and decide what additional programming that they want to offer and cover the tab for those extras with local taxpayer dollars. Gretchen is right. Teachers need more say so on what is taught and how. Duane is right that more attention needs to be paid to how students learn and especially what motivates them to learn, especially reading. Matt is right that the governor will not make much of a differenct either way though repeating 3rd grade doing the same things over again that didn't work the first time and A-F grades for schools are both a bad idea. Kids get different grades for different classes. Then they get a GPA. Makes sense for schools too. Carol is right that more money and attention needs to those who need it the most and Duane is right again that schools are already doing a lot that is good for those in the better schools with more resources. And Uncle... is right too that it might not matter if.... So much to agree on, but nothing is changing. Maybe its time to begin talking about what are the barriers to using what we know. Once we identify a barrier then we can workout how to overcome it. In my town the educators aren't trying recruit the community to help students learn, aside from allowing people 3 minutes at Board meetings there are no conversations that includes residents. The 'professional' expertise seems to prevent them from accepting the diversity of perspective and using it to make the group smarter and expand the resources available to solve the problem. Other than raising taxes, how does Whitmer plan to pay for her expanded plan? While I am supporter of early childhood education, whatever dreams of some utopic society where all business paying higher taxes will solve all financial shortfalls. Higher taxes, regardless of the good intentions will place a hardship on the working middle class and expand welfare rolls. Schuette's plan leaves the Upper Pensinsula dependant on nearly non existent corporate and non profit funding to offset low spending on needed educational resources. I am absolutely sold on the pre-school for all students and the two years of college. We need to get our very young children in school early so that we can give them all of the experiences and preparation for the learning they are not getting at home. This would be a fantastic move for Michigan children. I wonder how soon we could get it going once Gretchen took office? These are indeed moves in the right direction for our Michigan students! Seems like failing schools should get more help, not shut down just to over crowd other schools in the area. Over crowded class rooms are a hindrance to the teachers ability to be an effective educator.